In 2011, Christchurch, New Zealand was hit with a massive 6.3 magnitude earthquake. Among the city’s most heartbreaking losses was the destruction of the iconic 1864 Anglican cathedral. The city plans to have a new cathedral built, but designing and erecting a large building doesn’t just happen overnight. Shigeru Ban Architects, masters of cardboard constructions, came to the rescue with a temporary solution. 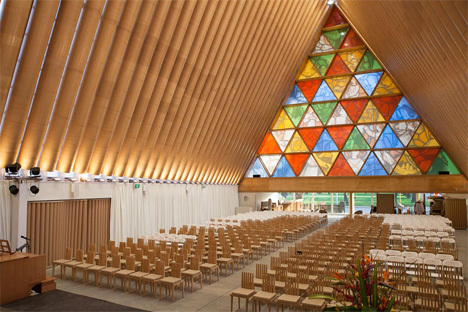 The Cardboard Cathedral is built to last up to 50 years, which should be more than enough time to get a permanent structure in place. 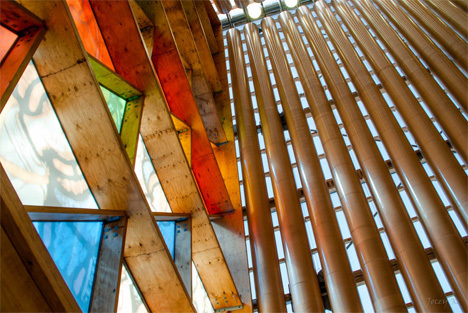 The temporary building is made from 98 cardboard tubes and eight shipping containers, with the tubes forming the dramatic ultra-high peaked ceiling. 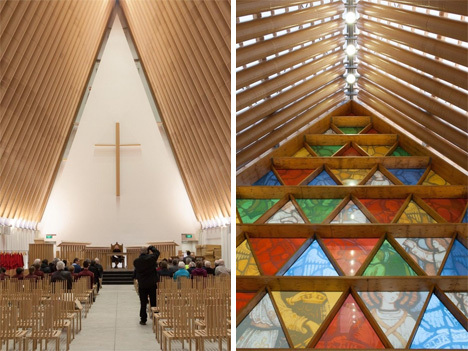 Rather than constructing a simple emergency building to house the congregation, the architect did something extraordinary and created a temporary cathedral that actually looks like a place of worship. 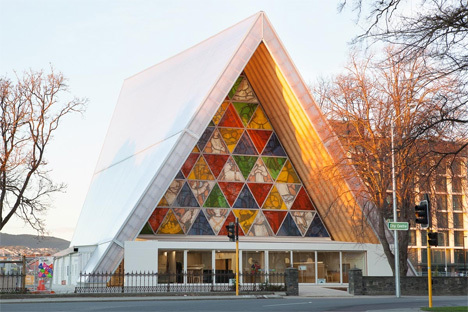 Shigeru Ban wants to make it clear that, although paper is traditionally a rather weak material, this structure is one of the most earthquake-proof in Christchurch. A concrete building is easily crumbled by an earthquake, but the paper building is far less rigid. This means that it can absorb the shock of a quake without falling apart. The cardboard tubes are coated with waterproof polyurethane and a flame retardant, so they won’t succumb to the elements. 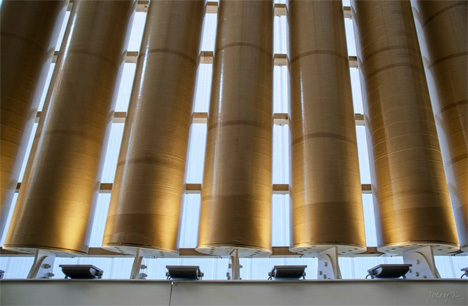 Outside of the cardboard tube ceiling, a semi-transparent polycarbonate roof adds further protection for the building and its occupants. The cathedral can hold up to 700 people, and not just for religious services; it can also be used as an event venue or concert hall. One of the most touching parts of this project is the etched stained glass window at the entrance. The colorful glass triangles show pictures from the destroyed church’s facade, ensuring that part of that beloved landmark lives on.